Harry Wiltshire leading out a swim in races of almost any distance is no surprise, but today he was not alone, as local Tenby resident and multiple winner of The Long Course Weekend, Oliver Simon, put his local knowledge to good use to stay right with him in 51:57. Debut Ironman starter Jesse Thomas (USA) was third out (54:20) with Nick Baldwin (55:16) also alone in fourth. The hard-riding Markus Thomschke (GER) was part of a five strong group who reached dry land in 57 minutes. 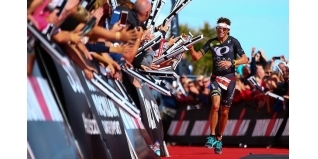 By 60km Thomschke had made his way to the front of the race, showing the pace that saw him lead off the bike earlier this year at Ironman 70.3 Staffordshire, but right with him was Thomas, just 40 seconds clear of Harry Wiltshire. 50km later – with 70km still to go - and Thomschke and Thomas were still locked together, but had extended their lead to more than seven minutes. Behind, Andrej Vistica (CRO), recent winner of Embrunman, had made up ground to join Wiltshire in 3rd/4th respectively. It was only over the final third of the ride that Thomschke was finally able to gap the determined American, and he would reached T2 with almost six hours exactly on the clock, three minutes up on Thomas. Vistica maintained his progress to come in alone in third, just under nine minutes down on the German with Norway’s Gudmun Snilstveit 11:46 back in fourth. Now 17 minutes back, Harry Wiltshire completed the top five starting the marathon. Running is the background of the perennial Wildflower Triathlon winner Thomas, and once out on to the marathon course he was making up ground on the German Thomschke. By 14km the Ironman debutant was into the lead, while Thomschke was digging deep to try and hold onto second place. Croatia’s Andrej Vistica was making a move and his 2:52:18 – just one second faster than Thomas – was enough for him to move into second, while the German closed with a 3:12:54 for third place. Great Britain’s Andrew Greenleaf from Team Freespeed put his disappointments at the Ironman 70.3 World Champs behind him and, showing the running ability of the 2:21 marathoner that he is, a 2:55:47 marathon moved him right through the field to take fifth overall and first Age-Group athlete and just get in front of Harry Wiltshire. If Great Britain’s Emma Pooley was going to back up her victory at last weeks ITU Powerman World Long Distance Championships in Zofingen, Switzerland, she was going to have to do a LOT of work on dry land. A 1:17:11 swim gave up almost 23 minutes to the leading pair of Anja Beranek (GER) and home athlete Carol Bridge, who came out of the water in 54:26. They had a two and a half minute gap over Katja Konschak (GER). Swimming being her weakness is hardly news – but that deficit was certainly significantly above expectations and not the start to the day she hoped for or needed. Germany’s Beranek is known as a class act on two wheels, and with a recent Bronze medal at the Ironman 70.3 World Championship, was really the most distinguished name on the pre-race startlist. She was soon clear of Carol Bridge once on to the bike. By 100km she had built a lead of seven minutes over Bridge, but was a full 30minutes clear of third-placed Eleanor Haresign, winner of last years Challenge Weymouth. When Bridge appeared to stop at some point on the bike (details TBC), Beranek’s lead expanded hugely and at T2 her lead was well over half an hour over the rest of the field. It would take a meltdown on the run to threaten Beranak’s lead and that didn’t happen. Her 3:23:16 marathon was more than sufficient to bring her home to a huge winning margin. Tineke Van Den Berg (DEN) took second place, while Katja Konschak’s race best 3:13:50 earned her the final podium position. After that slow swim, Emma Pooley’s hope for charge on the bike didn’t materialise leaving her well out of contention at T2. She did however produce a solid 3:22:38 marathon to take fifth place behind Tine Holst (NED).